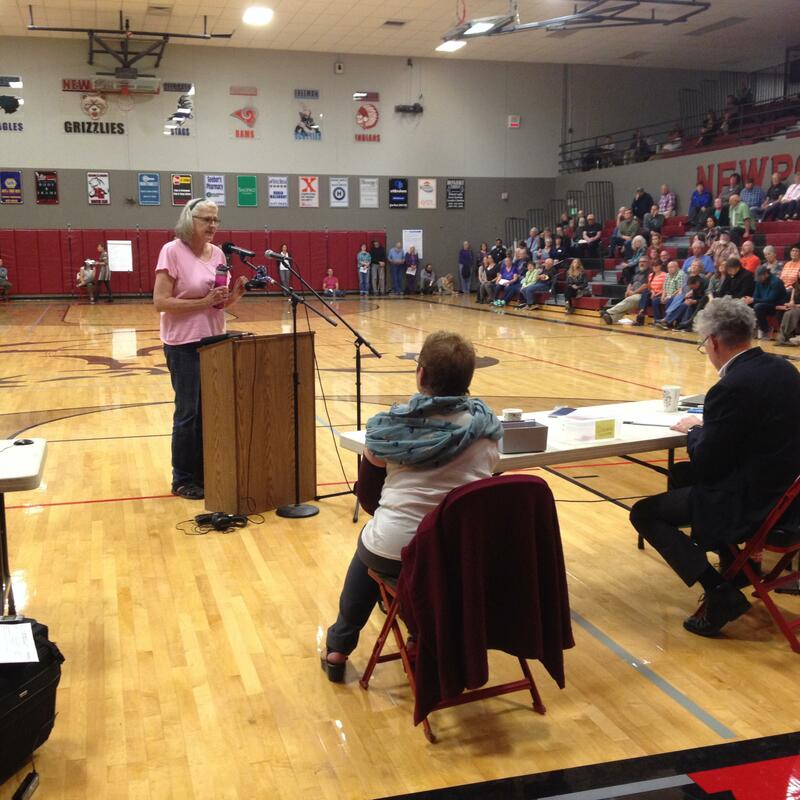 Newport City Councilwoman Nancy Thompson testifies at the Washington Department of Ecology hearing in the Newport High School gym. This week, a silicon smelter to be built just south of Newport, Washington was thrust back into the news. The project was proposed more than a year ago by a Canadian company originally known as HiTest Sands, but which now goes by the name PacWest Silicon. People in the greater Newport area, including in north Idaho, have been discussing it ever since. The Washington Department of Commerce gave the company a $300,000 grant. The process by which the local government sold land to the company for the smelter has been questioned. Now the environmental review process has begun. This week, the state Department of Ecology is holding three public meetings designed to help it determine which issues it should feature in the final document it will write about the smelter. At the first two meetings, Tuesday night in Spokane and Wednesday night in Newport, residents of eastern Washington and northern Idaho had a chance to voice their opinions. And opponents took full advantage. Several questioned the legitimacy of the state review process. It’s too early, they say. PacWest has not submitted detailed plans for its project, only a few pages of generalized information about it, a point made by Boise attorney Norm Semanko, He was hired by opponents to represent their interests. SEPA is Washington’s State Environmental Policy Act. It is the state law that governs environmental reviews. The Ecology Department wasn’t the only target. PacWest and its motives were questioned by Sister Leslie Lund of the Carmelite Sisters of Mary in Newport. “I don’t understand how the governor had the right to subsidize this project, right from the beginning. I don’t understand why this company, that’s Canadian company, would be getting deals on electricity, on taxes, on water and the price of the land. It seems unjust," Lund said. And several north Idaho residents argued it’s also unjust that they have no right to question a project that could inundate them with pollution. State Rep. Heather Scott says the project will also have an effect on Idaho, and therefore the environmental review should be conducted not in accordance with Washington law, but with federal law. “You put a nice diagram up there and you ask, ‘What should we study? Health? Climate?’ How about a box called Idaho and the Idaho citizens? And how this is going to impact Idaho citizens?” Scott said. Others say it’s not a matter of if the smelter will degrade the pristine environment in the region, but when. Lorraine Parlange is a lawyer from Airway Heights. Her family owns land near Horseshoe Lake. She says she worries that the toxins coming from the smelter’s stacks will exacerbate her daughter’s fragile medical condition. She asked about reparations. Christie Huling, who owns a garden business in Bonner County, said she supports the smelter, but admits she has some concern too. The smelter would be right in my backyard, she said. On Tuesday in Spokane, a representative of a Spokane union that represents construction workers says he likes the wages and health benefits that would come to his members who help build the facility. But the voices of other supporters at these two hearings were few. Nancy Thompson, a member of the Newport City Council, says she is trying to keep an open mind about the project. “I just hope that we can keep the conversation civil between the two different opinions,” Thompson said. Outside the high school, before the meeting, three men proudly displayed a large yard sign for the organization that supports the smelter. A few people said the smelter has them making plans to leave the area. They included a man who called himself Sean. “It’s led me to try to sell my private properties and, therefore, my business, to relocate outside Pend Oreille County. This has proved to be impossible because nobody is buying in the Newport area because of the wait-and-see attitude," he said. The Department of Ecology will hold one more public meeting tonight [Thursday] at 6 at the events center in Priest River, Idaho. It will also hold a webinar next Thursday at 3 pm. The agency will accept public comments, in writing, online and in other forms, until October 26. It expects to release a draft environmental impact statement for the project next fall for another round of public comment. Critics of a proposed silicon smelter in Newport are urging Washington’s Department of Ecology to take a close look at the project as it begins its environmental review. 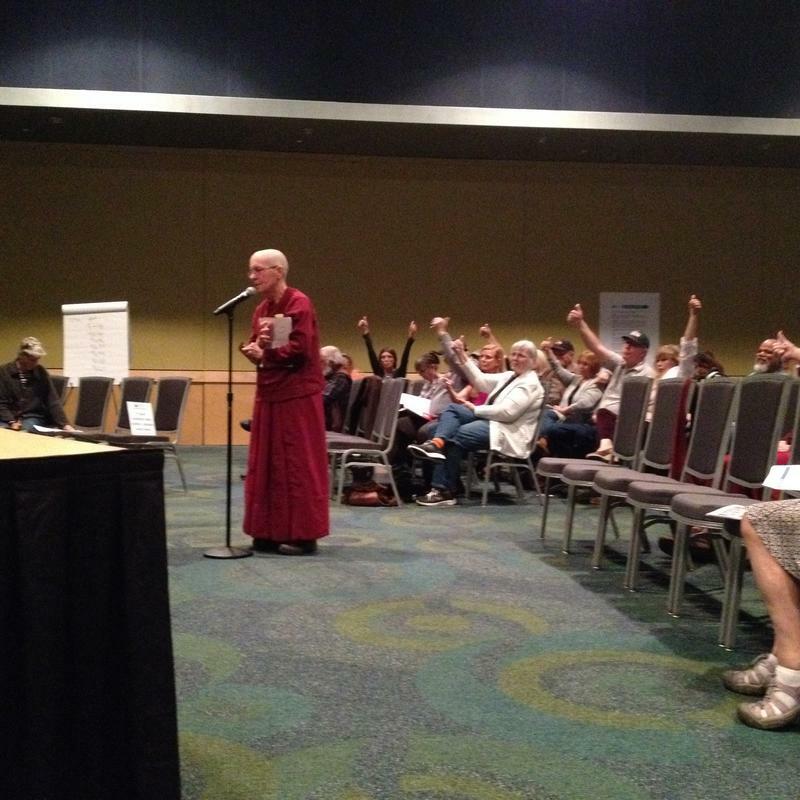 They spoke at the first of three public meetings last night [Tuesday] in Spokane. The Canadian company PacWest Silicon proposes to build its smelter just to the south of Newport, next to the border with Idaho.